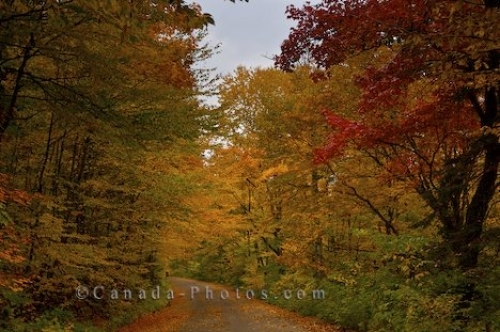 A narrow road surrounded by hundreds of trees winds its way through Jacques-Cartier Park in Quebec, Canada and when the Fall colors fill the forest, the drive is stunning. Small patches of green are still visible amongst the trees, but a majority of the roadside forest is a display of reds, oranges, yellows and browns. Picture of the colorful display of trees during the Fall in Jacques Cartier Park in Quebec, Canada.